The flowers and label are cut on my Cricut with both of the Close to My Heart cartridges (label from Art Philosophy, roses from Artiste). I sprayed the flowers with a little bit of yellow glimmer mist to add a little bit of sparkle to them, although it is a little hard to see in the pictures. The only thing is that it did change the colors of the flowers from a soft yellow to a brighter one, but I still love the look. The butterflies are from a Martha Stewart punch, the sentiment is from an older Stampin' Up set and the patterned paper is unknown from my scrap pile. I added a little stitching from my sewing machine and a pen to finish the card off. Thanks for stopping by!! amy this is just beautiful! Wow Amy your card is beautiful! TFS. Can you share how you did the crinkle seam binding? Amy ~ Well this card is just BEATUIFUL! The colorsa are spectacular with the mint seam binding! The flowers witht he pearls are just GORGEOUS! So very pretty! The little touches of black unify everything. 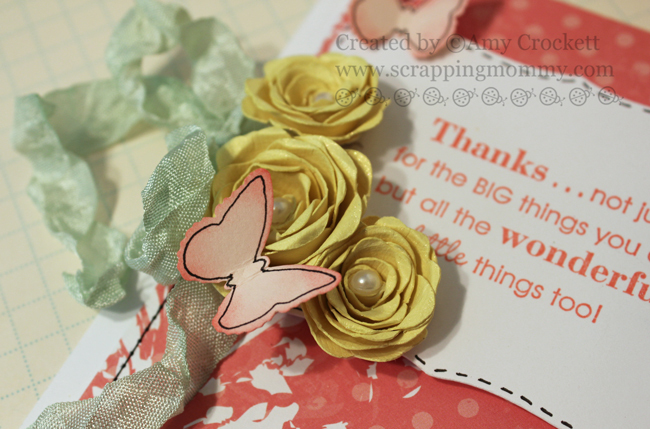 This is such a gorgeous card, Amy! I love all of the elements, and that sentiment is so sweet! Love the flowers and the butterflies. Very pretty card Amy. This card is GORGEOUS!!! Thanks for sharing, great inspiration!!! Such a beautiful card Amy..love it!